As I am sitting here at my desk writing this, I am watching my two year old son play with his favorite Thomas the Train engine, sipping my second cup of coffee, and preparing my schedule for the day – it is going to be a busy one with client calls, calls on behalf of clients, arrangements to be made for new office space, studying for a mid-term economics exam and playing taxi for my daughter’s gymnastics practice and I have 8 hours to get it all done between snack time, nap time, diaper changes and lunch. There will probably be a few tickles in there too somewhere and oh yeah, my house will be cleaned from top to bottom. After that I am off to write that exam and try desperately to maintain my 4.0 GPA. No I am not super woman, I am just a busy woman balancing a full time home based business with the demands of stay-at-home-motherhood. So how am I going to accomplish everything I need to do today? Well like I said, I am scheduling my day – proper time management is imperative – but I am also delegating. Yep, as I am sitting at home, someone else is cleaning it. Does that make me sound lazy? Extravagant? Spoiled? I am none of those things – what I am however is practical. I charge anywhere from $20 – $45 per hour for my professional time and I am fortunate to have the business in place where I can work as many hours as I have available. I shouldn’t really say fortunate because that implies that my client base has come from sheer luck when it really came from investing the last 5 years into building my business contacts, working on expanding my skill set… you know the drill. I cannot pay anyone to work my business for me, my company is based on my expertise and personal attention, I have to do it myself. Just like being a mom. I cannot pay someone to play choo choo with Ivan the way that I can, or chase him for 5 minutes before tackling him with tickles to change his diaper. No one on salary can make his lunch the way I do or put him down for a nap in his Thomas toddler bed the way I do. I cannot pay someone to listen to the exciting day of an 8 year old as she talks incessantly for the 40 minutes it takes to get to gymnastics and I doubt anyone can get her hair ‘just right’. Those are Mom things and above all, I am a mom. That’s why I started this company – so I could be home and be a mom. So in my 8 hours day before heading out to play taxi, student an transfer the toddler to my husband who will bring him home and start dinner for us all, there is only so much that I can do and as much as I love a spotless house, I would have to give something up to get it. From an economic standpoint – what is the opportunity cost of a clean house? Well it would be lost time with my children, lost income from time I could be spent on revenue generating activity, it could include a drop in grades as I would have less time and focus for my studies and let’s face it – somewhere in here I have to find time for a shower… Those are some pretty high costs but yet it needs to be done so what’s a working mom to do??? Well, I could bite the bullet and try to do it all. I could stress about it, rush around, demand more help from my already over-worked husband who values what time he has at home as time spent with the kids. I could also live in a dirty house. Those are all options but what I choose to do is face the stigma of being a ‘lazy over indulgent housewife’ and hire someone to do it for me. I can’t hire someone to make my money or be a mom to my kids but I can hire someone to clean my house. and I do. I do it gladly. 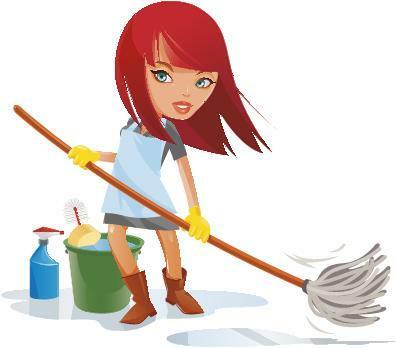 I pay our housekeeper $15/hour to come into our home and clean our 400o square feet from top to bottom every two weeks. She scrubs all three bathrooms, dusts, vacuums, mops, changes linens, cleans the kitchen counters and helps with whatever I need her to help me with. I have had her do windows, wash walls – organize cupboards… she is awesome. She costs me $200/month. Yes it is an expense but is it worth it? Well let’s look at the opportunity cost of that $200. It costs me 8 hours of work a month to pay for her but it takes her 12 hours a month to do her job. It would take me at least 16. So it actually saves me 8 hours of my own time allowing me to either earn an additional $200 or spend more time on my family. Not to mention that I am helping another woman earn income to help support her family. Hmmmm….. when you look at it that way – how many of you working moms can’t afford NOT to have a housekeeper?